After a two-month break from the Daring Bakers and three missed challenges this year altogether, this challenge was in many ways a crucial one. At the beginning of this month, I found myself at a turning point. A tough decision had to be made - to miss yet another challenge and consequently lose my Daring Baker "license", or to muster up the strength and participate in the challenge. It took me almost a whole month to figure out what to do, which is why I once again found myself baking (or should I say freezing?) and assembling this lovely cake the very last minute. Why am I telling you all this? Well, I very recently found out that I have some health issues, potentially serious ones. At this time I'm still not sure what the exact diagnosis is, but I do know that I have to follow a very strict diet plan. 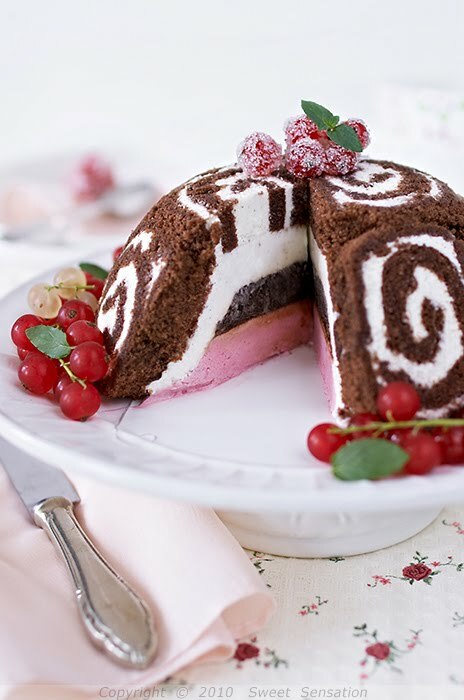 Needless to say that scrumptious desserts and ice cream bombe cakes are out of the question. 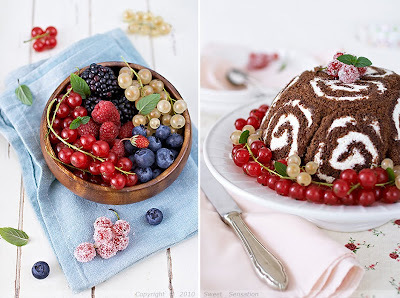 Since my husband and I live alone and most of our friends and family are already enjoying their holidays at the seaside, it seemed a terrible waste to make this lovely cake and then throw it away. Although my hubby has a very healthy appetite, eating a whole cake would be a bit too much for him to handle. He did, however, offer to do it if I eventually decide to participate in the challenge. :) Since he was really supportive and full of understanding regarding our new eating habits, I finally decided to participate in the challenge and cheer him up with a cake I knew he'd love. I did, however, scale down the recipe and make some minor adjustments in order to get one small cake. The recipe itself was very good, clear and well written with many useful explanations. Our hostess did a very good job indeed! All the measurements were correct and everything turned out beautifully. I do, however, have a small complaint regarding the swiss roll. I sprinkled some sugar on a kitchen towel and turned the cake on it, like the recipe says. I don't know if this step has some kind of a purpose, but in my case it resulted in the cake sticking to the towel so badly that I literally had to peel it off. I was left with ruined kitchen towel and an ugly cake. If you think about it, it makes sense. If you put a hot cake onto a layer of sugar, the sugar melts and sticks to the cake and the surface. So, my advice is to avoid this step if possible. As far as the flavors are concerned, I really liked the original ones and decided to stick to most of them, with some minor changes. I omitted the chocolate ice cream all together because it would be such a pity not to use some fresh summer berries while they're at their best. For the swiss roll, I made a vanilla cream cheese filling. For the hot fudge sauce I used the challenge recipe and it was really good. I added yogurt to both ice creams just to add a bit of freshness and lightness to the flavor. So I ended up with a yogurt vanilla ice cream and a red currant ice cream. I made just one swiss roll and assembled the cake in a small bowl, so my final ice cream bombe was 16cm in diameter and 8cm high. I still had leftovers, but those freeze very well so it's all good. Besides, it's handy to have some home made ice cream in the freezer, don't you think? So, here's my scaled recipe with all the adjustment I made. If you'd like to make a regular size cake, just double the ingredients or take a look at the original recipe. Preheat the oven at 200°C. Brush the baking pan (11x9 inches) with a little oil and line with greaseproof baking paper. In a large mixing bowl, add the eggs and sugar and beat till very thick. When the beaters are lifted, it should leave a trail on the surface for at least 10 seconds. Sift together the flour and cocoa powder and fold this mixture into the eggs gently with a spatula. Fold in the water. Pour the mixture into a baking pan and spread it out evenly. Place the pan in the centre of the preheated oven and bake for about 10-12 minutes or till the centre is springy to the touch. baking paper. Trim any crisp edges. Starting from one of the shorter sides, start to make a roll with the towel going inside. Cool the wrapped roll on a rack, seam side down. Grind together the vanilla pieces and sugar in a food processor till nicely mixed together. In a large bowl, beat cream cheese and vanilla sugar until soft and creamy. Add the whipping cream and beat until very thick. 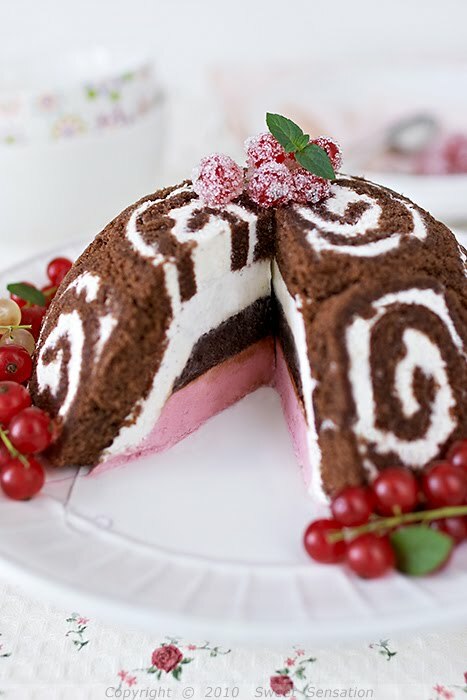 Open the swiss roll and spread the cream cheese filling, making sure it does not go right to the edges. Roll the cake up again, this time without the towel. Wrap in plastic wrap and chill in the fridge till needed, seam side down. Grind together the sugar and vanilla pieces in a food processor. In a mixing bowl, whisk yogurt and vanilla sugar lightly till everything is mixed together. Add whipping cream and beat until very soft peaks form. In a small saucepan, whisk together the sugar, cocoa powder, cornflour and water.Place the pan over heat, and stir constantly until it begins to thicken and is smooth (about 2 minutes). Remove from heat and mix in the butter. Keep aside to cool. In a mixing bowl, whisk the yogurt, red currant puree, sugar and lemon juice until everything is mixed together. Add whipping cream and beat until very soft peaks form. Cut the swiss roll into equal slices, approximately 1,5 cm each. 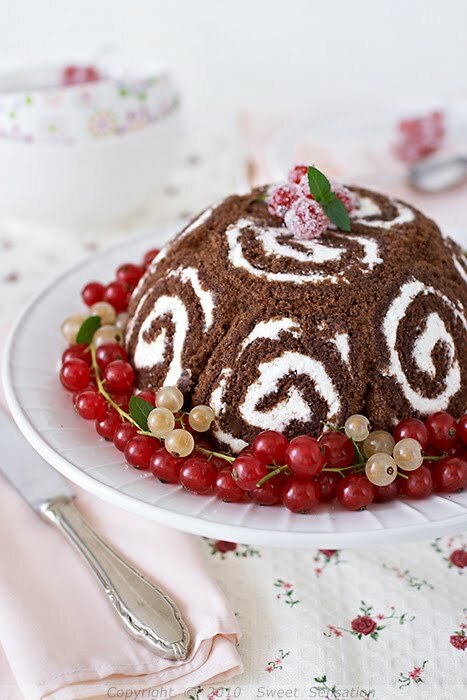 Cover the bottom and sides of the bowl in which you are going to set the dessert with plastic wrap. Arrange two slices at the bottom of the pan, with their seam sides facing each other. Arrange the swiss roll slices up the bowl, with the seam sides facing away from the bottom, to cover the sides of the bowl. Cover the bowl with plastic wrap and freeze till the slices are firm (at least 30 minutes). Soften the yogurt vanilla ice cream. Take the bowl out of the freezer, remove the plastic wrap and add the ice cream on top of the cake slices. Spread it out to cover the bottom and sides of the bowl. Cover the bowl with plastic wrap and freeze till firm (at least 1 hour). Add the fudge sauce over the yogurt vanilla ice cream, cover and freeze till firm (at least an hour). Soften the red currant ice cream and spread it over the fudge sauce. Cover with plastic wrap and freeze for at least 4-5 hours till completely set. Wow, your cake is perfect and beautiful! One of the prittiest i have come across. Such splendid shots and gorgeous flavors. 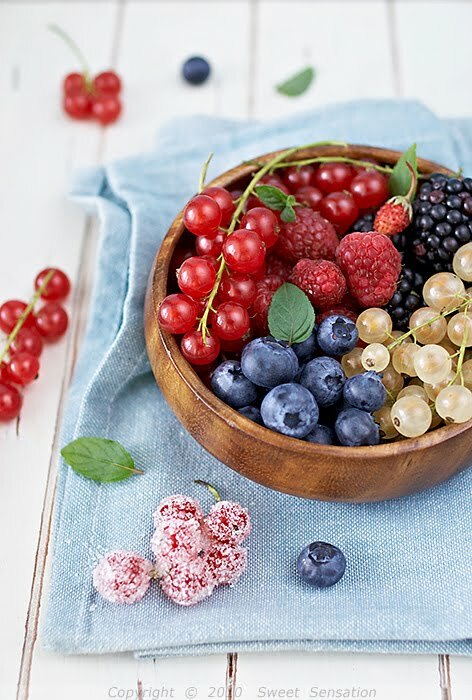 Love your use of red currants - the sugared ones are so pretty. Your layers and cake are all very neat and accurate - great job! Your cake is so clean and elegant. 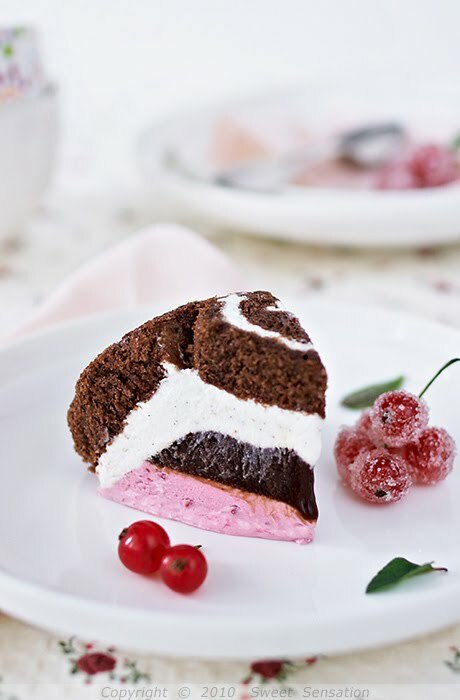 I am diggin the frozen cream cheese roll filling, I have eaten cheesecake out of the freezer before and its delish! Sorry to hear about the health problems and diet restrictions Monica. Hope they find out the cause soon..
On the challenge, what a fabulous comeback! I know the troubles of baking for two, since it's the same here and you have done such a fantastic job! love the red currant ice cream!!! Too, too beautiful. It will be a real shame if your potential health problems prevent you from doing more beautiful things like this, and I'm so sorry to hear about it. You're an exceptional photographer, and you really baked this dish perfectly. I'm amazed! Your husband must have been over the moon. Predivno izgleda ova tortica od rolada i sladoleda..Otvorila mi je želju za slatkim..a sličice klasično savršene..kao uvijek! What a beautiful job you did - I love the flavors that you chose, and the photos are stunning. I am sorry to hear about your health concerns, but hope that a diagnosis comes soon and that treatment is swift and easy on you. 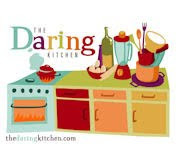 Welcome back to the Daring Bakers! Your cake is so beautiful! The colors are so striking! I would love to taste that red currant ice cream sometime! Wonderful job on the challenge; I'm glad you were able to participate! Predivno! Izazov je zaista bio veliki, sve ovo izgleda tako komplikovano, a ti si savršeno odradila zadatak. Imaš zlatne ruke, svaka čast. What an absolutely beautiful cake! I'm sorry to hear that you are having health problems. I hope they find the cause soon and wish you luck on a modified food diet. I totally understand as I was going through that a few months ago and had to decide whether to do a challenge and not eat it or not do the challenge at all. You did a fabulous job! What a great idea to use fruit and yogurt. Mr. Fine and I found the cake very very rich tasting. As it was my second challenge and I kept putting it off and off, I played it safe and stuck to the recipe as given. I admire your courage in the kitchen! Pogledala sam i druge, mogu samo reći da si diva među Daring Bakers-ima. Žao mi je stvarno čuti da imaš problema. Držim fige da sve bude u redu..
torta ti je stvarno ispala .. ma savršeno. svaka čast . All the best to you and don't forget that your health is always more important than a daring bakers licence. I really like your challenge, great clean cut! pogledala sam kreacije ostalih kandidata i tvojoj nema ravne. BRAVO! What a beautiful bombe!!! Love your photos! Hope you overcome your health issues soon. I'm sending you positive energy!!! if there were a first prize..You would get it..this looks PERFECT! I hope the diagnosis will come back just fine. Wish you well always, Monika! One of the prettiest cakes I 've seen so far. Love the colours and how professional it looks. I love what you've done,,its so pretty!! the pics are very nice as well :) wish mine was half as nice! 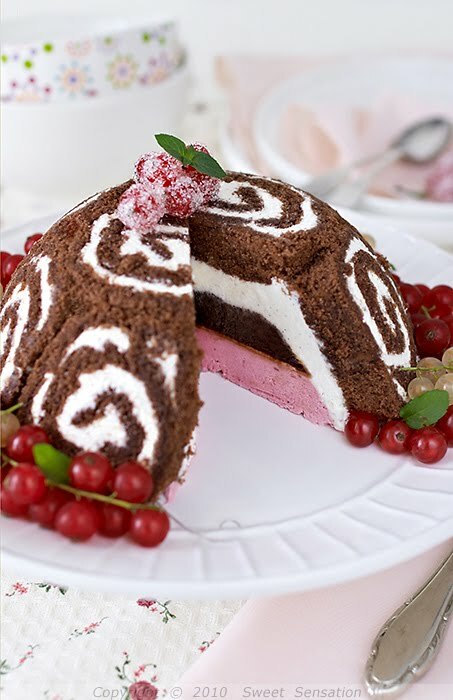 Torta je jednostavno predivna, jako,jako lijepa i efektna ! Napravila si je odlično i ovoje zbilja za gledati i diviti se. Divim ti se kako se suzdržavaš pored nje, a jako mi je lijepo pročitati kako si je napravila za svoga muža koji voli ovakve kolače i zauzvrat podršci koju ti pruža.Prekrasno i bravo ! Nadam se da će konačna dijagnoza ipak biti dobra ! !